We are honored to have you consider partnering with us to educate your child. We offer a Preschool – High School educational program that is dedicated to providing each child with a quality academic experience while at the same time nurturing and encouraging them to grow in their knowledge and faith in Jesus Christ. 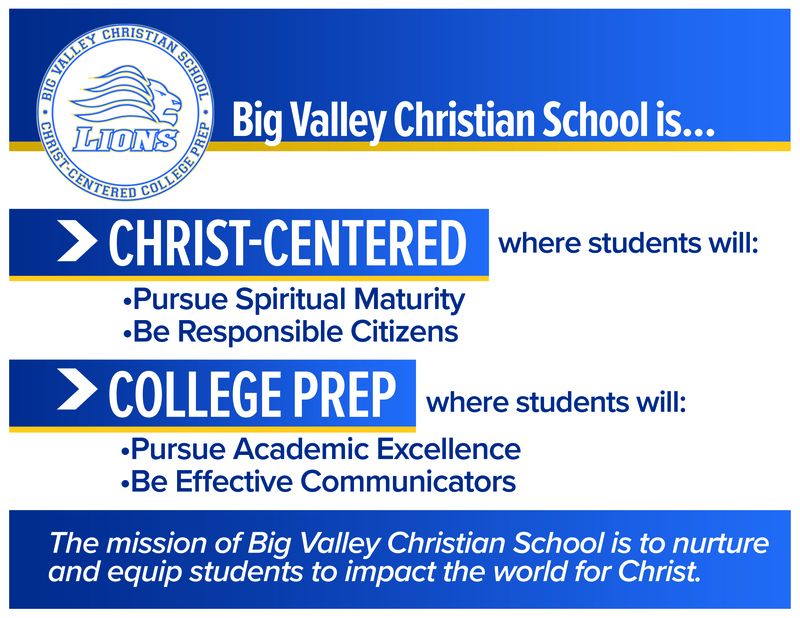 The mission of Big Valley Christian School is to nurture and equip students to impact the world for Christ. The vision of Big Valley Christian School is to glorify God by striving to reach the highest standard of Christian education. Students at Big Valley enjoy a wide variety of experiences from academic challenges to athletic competitions. They have multiple opportunities to develop their talents and gifts in the fine arts as well as experiences in serving and contributing to the community around them. Big Valley students are encouraged to integrate spiritual, intellectual, social, emotional, and physical facets of their lives into behavior that leads to balanced, healthy, and God-honoring lifestyles. We would welcome the opportunity to meet and to give you a tour of our campus. Our principals can be contacted through this website or by calling the school office. We pray that God would direct your path as you seek His best for your children.